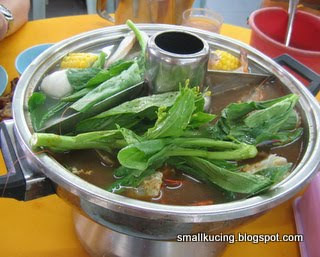 Yesterday we had Steamboat lunch at Yuen Steamboat again. Auntie Siew belanja for Papa and my birthday. Thank you very much, Auntie Siew. Gt makan-makan and a big angpau.Paisehnya. Mamarazzi got crazy liao. Took a whole plate full of her favourite Chicken "heart".In fact the "kiap" al the "heart" from the buffet tray. 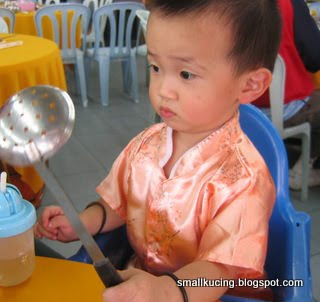 Thus if you were at Yuen Steamboat yesterday and found all the "heart" missing, you know who is the culprit-la. Very hungry..getting ready to eat. Why takes so long to cook one? 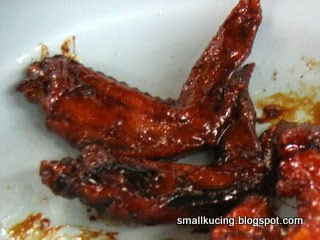 Hmm....*drooling* nice looking BBQ Chicken Wings. Kor Kor Andrew so pandai. Got a plate full of chicken wings for everyone. Best thing about going to Yuen Steamboat at lunch time is that you won't need to fight for the chicken wings. No crowd thus plenty to go around. 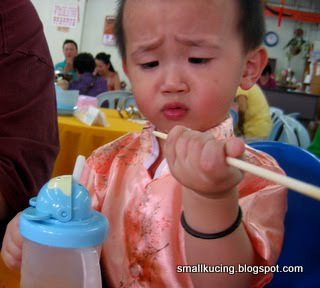 Am learning how to use chopstick...use one to poke the fishball. 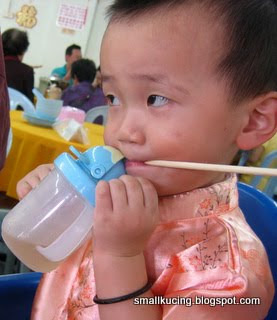 I wonder if the chopstick can double up as a Straw. Experiment first. Poke into my "Happy Mug". 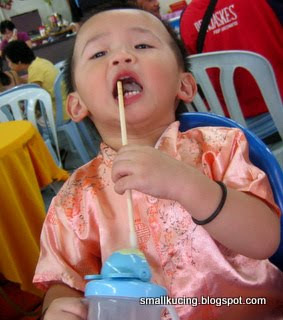 Huh...chopstick cannot double up as straw ah? Once again, thank you Auntie Siew for the lovely lunch. Happy Birthday PAPA! Wah! 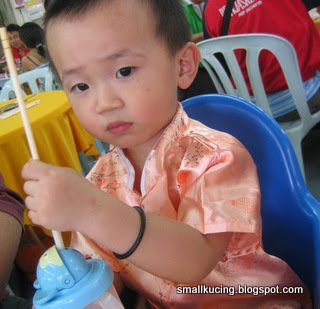 You have so many Chinese baju... So handsome lah! Hahahahaha!!! Eeee....those chicken hearts, your mama ate so many, in the end become chicken-hearted (scaredy cat!). LOL!!! Happy Birthday to Joshua's papa, Kathy's husband! Wish u good health and happiness always! coming back to the post, your mama really craze for those chicken's hearts? oh gosh!! they are kai tern, right? Happy birthday to both papa and small kucing. Thank you. Yalor ...i crazy about the chicken heart. Cantonese called "Kai Sum".Nice to eat wor.. 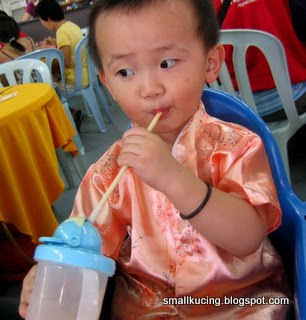 I wonder why they always make the CNY costume from hot material ah? 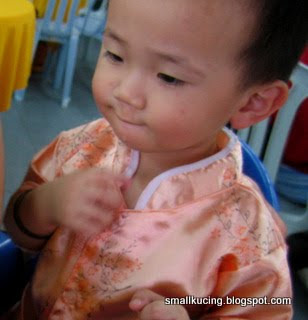 i was about to ask the same thing, always kungfu baju je anak you. hehehe! He was very hungry then coz didnt have much breakfast. I love "chicken heart" too, but your mama one big bowl, make me scare and i never try before steamboat buffet got serve chicken heart??? 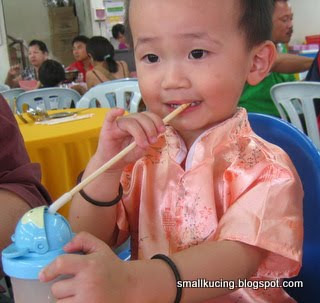 smallkucing so cute in the chinese attire. eh...chicken heart..yucks! Wah... inside there got jagung summore... so nice! hope that u enjoy it. It looks so festive in your place. Uiks! Mommy also 22nd ah? wah lau eh...why so many 22nd one leh? Mamarazzi know two others friends whose birthday falls on 22nd also. Wah, Mamarazzi really can eat that much of chicken heart ah? 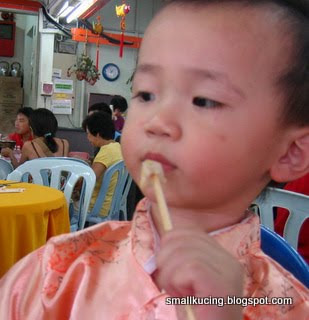 Last time when I was a child, I used to like the taste of chicken heart and love eating it, but when I became older, I find the chicken heart smell too strong to tahan, so now don't like to eat already. 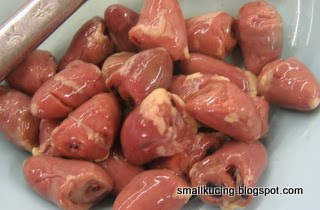 Kathy, I never tried chicken heart but I am sure it taste good. Just like some people dislike kerang. For me, I like it very much!